People visit Joshua Tree National Park in Southern California's Mojave Desert, Thursday, Jan. 10, 2019. But now, viral pictures of these protected trees show a vastly different scene unfolding at Joshua Tree National Park, about 130 miles east of Los Angeles. The trees in the photos have been felled and are lying on the dusty ground – and Park Service officials say people, not Mother Nature, are to blame. Shared widely on social media Thursday, the photos have sparked outrage over the plight of national parks that remain open amid a partial government shutdown, leaving them understaffed and vulnerable to the antics of unruly visitors. Parks nationwide have struggled to deal with a variety of issues ranging from rampant littering and overflowing public restrooms to the vandalism of habitats. “I don’t care if you’re a Democrat or Republican, what’s going on at Joshua Tree National Park is a travesty to this nation,” one person tweeted. The park spans more than 1,200 square miles, straddling the Mojave Desert and Colorado Desert, but only eight law-enforcement rangers are patrolling the vast landscape during the shutdown, National Parks Traveler, a nonprofit dedicated to news about national parks, reported. “While the vast majority of those who visit Joshua Tree National Park do so in a responsible manner, there have been incidents of new roads being created by motorists and the destruction of Joshua trees in recent days that have precipitated the closure,” the Park Service release said. On Wednesday, the Park Service announced that it would be able to remain open by using funds from recreation fees. 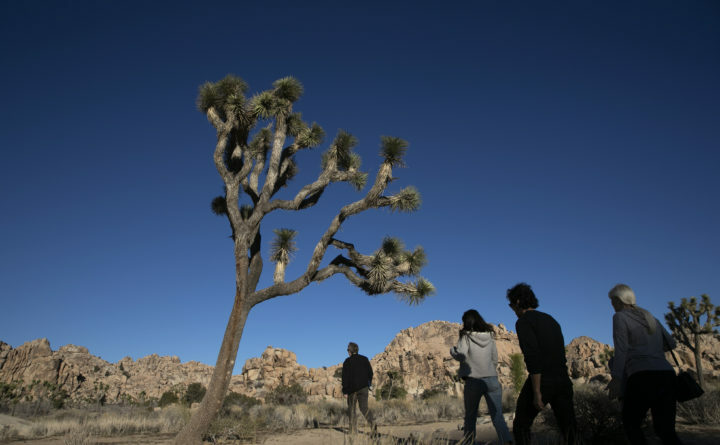 Joshua Tree National Park Superintendent David Smith told National Parks Traveler that visitors have been illegally off-roading, cutting down trees and spray-painting rocks, among other infractions. “Joshua trees were actually cut down to make new roads,” Smith said. Aside from being one of the park’s most recognizable features, Joshua trees are at risk of being affected by climate change. Researchers from the University of California at Santa Cruz found that Joshua Tree National Park is on track to lose most of its Joshua tree habitat to rising temperatures by 2100, according to a September study published in Ecosphere, an open access journal affiliated with the Ecological Society of America. “Its [sic] like if someone took a pickax and started breaking up the geysers at Yellowstone,” one person tweeted. Some quickly placed blame on the politics behind the government shutdown. But Abbott said there could be a “silver lining” to the shutdown: It has drawn people’s attention to the abuse that has been going on at national parks nationwide for years. His own efforts to preserve Joshua Tree have also received recognition and may be starting to spark change. Abbott said visitors have approached him saying how they took extra care to tidy their campsites before leaving the park. Some have even volunteered to take a day out of their trips to help pick up trash.